Manipal College of Medical Sciences (MCOMS) is a private medical college located at Pokhara, in Nepal. It is associated with Manipal Teaching Hospital, and enrols about 145 students each year for the MBBSmedical qualification. MCOMS has two locations in Pokhara. The basic sciences campus is located at Deep Heights, and 1st and 2nd year courses are taught there. The administrative block is also located at Deep Heights. The clinical campus with the teaching hospital, is located at Phulbari, Pokhara, overlooking the Annapurna mountain range. MCOMS is recognised by the Medical Council of Nepal, Sri Lanka, and other countries. It is also recognized by WHO and under FAIMER. 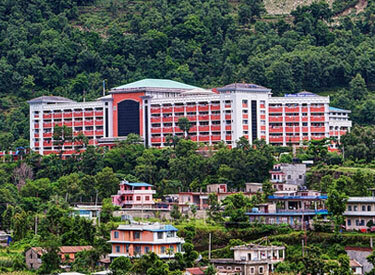 Manipal Teaching Hospital (MTH) is a 700-bedded hospital, located at Phulbari, Pokhara. The 5-storey hospital building houses an extensive medical library, students classrooms, a canteen, the main atrium, an auditorium along with outpatient departments and inpatient wards. All the medical students and faculty reside close by in other buildings.